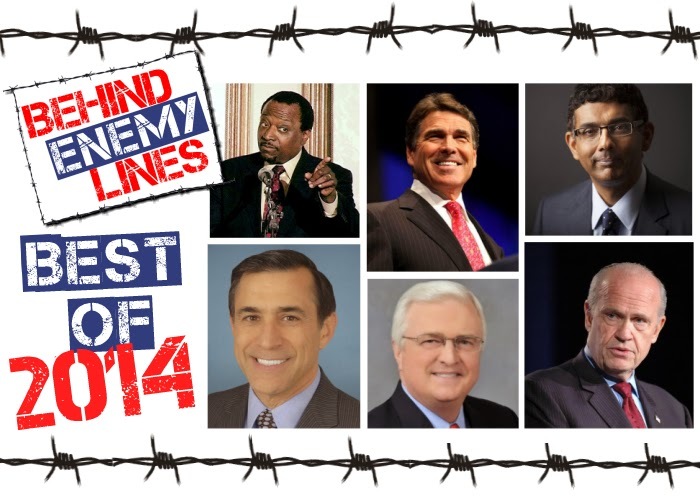 Home / Alan Keyes / Behind Enemy Lines / Darrell Issa / Diana Sepulveda / DInesh D'Souza / Gene Berardelli / ICYMI / Rick Perry / Russell Gallo / Sen. Fred Thompson / Van Hipp / Best Interviews of 2014! On behalf of everyone that works with me to make Behind Enemy Lines happen, I want to with you, your friends and your families and happy and hearty Thanksgiving! As we take this week off to reflect on the importance of our family, our nation and all of the blessings of life for which we are thankful, I thought I’d present some of the great interviews we did this year as a way to express my thanks to everyone here at We Are America Radio for a fantastic year. IN this show, you’ll hear clips of interviews we did with TX Gov. Rick Perry, CA Congressman Darrell Issa, former U.S. Senator and veteran actor Fred Thompson, author and film-maker Dinesh D’Souza, former U.N. Ambassador and Presidential candidate Alan Keyes and former Deputy Assistant Secretary of the Army Van Hipp. Thank you one and all – enjoy your holiday weekend!